Soneva Kiri Reservations. Call 020 7962 9933. Soneva Kiri is around 300 miles east of Bangkok and 60 miles off Thailand's mainland, on the island of Koh Kood. With a growing reputation for unspoilt natural beauty, the island and resort provide a luxurious hideaway, and the villas nestle among hills and a secluded bay. With features including an outdoor cinema and homemade Thai cuisine served in a treetop Dining Pod, there's nowhere quite like it. Here you can enjoy all watersports, take boxing and yoga classes, go jungle trekking and visit a honey farm. And the kids will just love The Den. 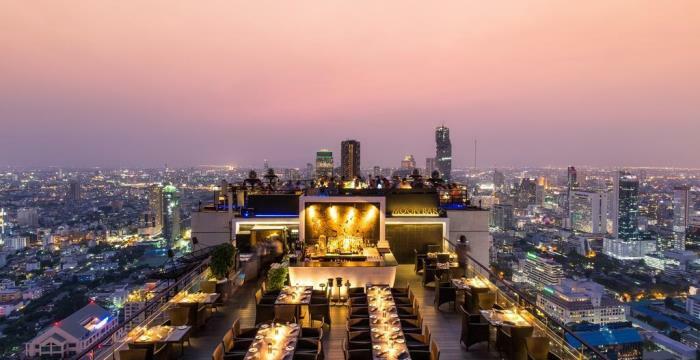 Spend a special three nights sampling the amazing hospitality at the Banyan Tree hotel in Bangkok which has luxurious rooms with views over the city and river, a rooftop restaurant and bar, a spa and pool and seven dining options. Then you have a free transfer to the unspoilt tropical island of Koh Kood for seven relaxing days and nights at the Soneva Kiri, staying in a luxurious beach-side villa with private pool. There are great watersports on offer and you can sample a wide variety of authentic Thai cuisine at The Benz restaurant. Soneva Kiri lies 350km southeast of Bangkok and 80km off Thailand’s mainland, on the island of Koh Kood. With a growing reputation for unspoilt natural beauty, the island and resort provide a luxurious hideaway, with villas nestling amongst the hills around a secluded bay. With unique features such as an outdoor cinema and homemade Thai cuisine served in a treetop Dining Pod, there’s nowhere quite like Soneva Kiri. The Six Senses Spa, hidden among the foliage at Soneva Kiri, specialises in locally inspired treatments. Unwind with the Jungle Escape, which begins with a herbal scrub over a heated stone bed and under a bamboo mist shower. A traditional Thai herbal massage follows, with ingredients picked in the resort’s jungle garden. This is just one of the many signature treatments on offer. The 29 villas at Soneva Kiri are all large and luxurious. Built from local timbers and furnished in an effortlessly chic style, some have views of the sunset, some of the sunrise. Private swimming pools wrap around every villa, while electric buggies offer easy access around the resort. A range of accommodation is available, from cosy one-bedroom suites to the palatial five-bedroom Private Beach Reserve. As well as the expected water sports on offer at Soneva Kiri, such as diving, kayaking and wakeboarding, the resort also has a tennis court and runs Thai boxing and yoga classes. Experiences include jungle trekking, a visit to the local honey farm and wine-tasting and cookery sessions. Children will love The Den, a bamboo play house with supervised activities. A selection of diverse eateries bring a unique character to Soneva Kiri, where guests can dine over water on home cooked Thai classics or rise to gourmet heights in the treetop Dining Pod. Sample the day’s freshest catch, feast on organic fare by starlight while overlooking the Gulf of Thailand, or experience destination dining on a deserted beach. As always Raj does what he says he will. Reliable, professional and will use again and again. Really impressed with the whole service flights, hotels, all excellent! Stan is great. Would never use any other travel agent. He is responsive and creative with ideas to enhance our trips. Fully trust that he has always thought of everything we may need.